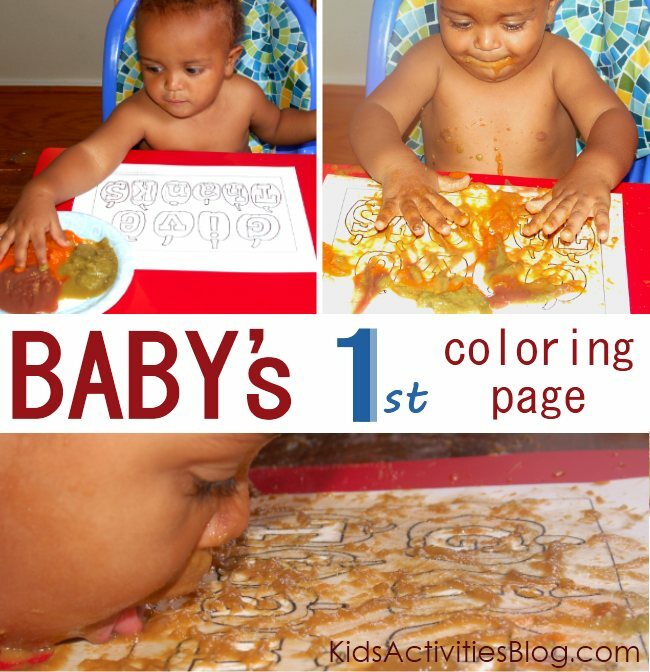 A simple Thanksgiving coloring page plus a one year old…what fun! Today, here at Kids Activities Blog, our coloring pages for kids series continues with an idea to get the younger ones involved. 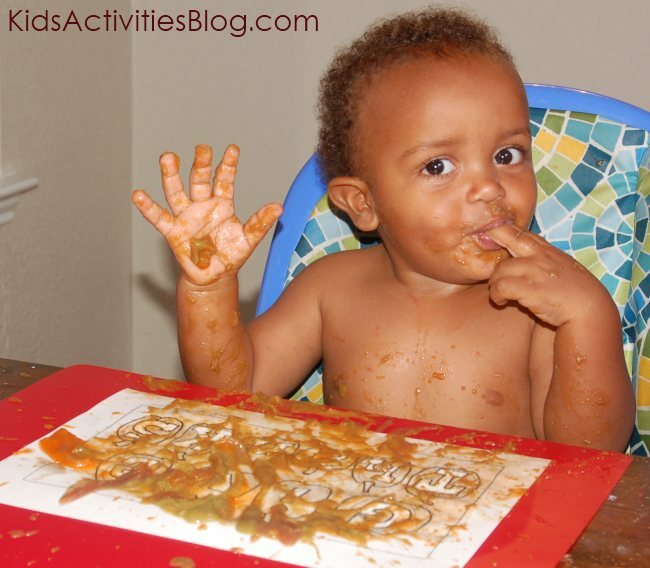 My cutest little man loves to make a mess…. and we love Fall Printable Coloring Pages! Inspired by a post by No Time for Flashcards, where her tyke played (aka made art) with sweet potatoes. It made sense to me to have a spin-off of her activity be our fella’s first “official” art creation on the blog. We have a fun printable, which would be great for the older kids to use as a Thanksgiving place-mat/coloring page, and I thought it would make a terrific canvas for his sensory exploration. I tried to pick brightly colored fruits and vegetables, with the hopes that they would show up on the paper once it was dried. We chose carrots, green beans and blueberry applesauce. In preparation for his “debut” to the blog, we taped the placemat and the coloring sheet down, then colored in the letters with a white crayon. My “plan” was that the picture would be a smearing of fall hues and that the letters in the coloring page would pop out as they would remain white amidst the smear. Plans rarely go as you plan. While I did expect Noah to have a blast, I did not expect the page to remain white (well, maybe it became off-white). Remove their clothes. For reasons unknown to me, carrots *will* stain shirts (even if they fail to leave a mark on the coloring sheet. Ha! Instead of putting the foods onto a separate plate (as pictured), drop them directly onto the printable. My little man kept expecting me to get a spoon and was becoming a bit frustrated when I didn’t produce one. Dumping the food onto the picture and putting his hand into it helped break the ice a bit. As I said earlier, tape the paper down. Otherwise, they just might be eating the paper instead of the “paint”. Have rags ready nearby for clean-up and have fun! My older kids were *SO* jealous, they saw how much fun their younger brother was having and wanted to “color” too! I would have thought that the combination of those “first foods” would have been nasty. But my little man, and his siblings who all had to have a taste, thought that the mixture of carrots, beans and blueberries was absolutely marvelous. He even went so far as to lick up his work (or attempt too). 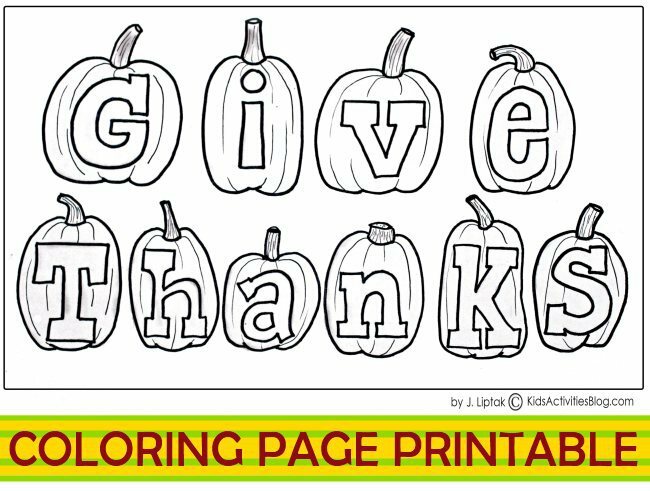 I hope you enjoyed our free Thanksgiving Printable Coloring Page. Older kids might enjoy making a list of things they are thankful for with this version – perfect for a new Thanksgiving Tradition.